It’s clear the film has its heart in the right place but the blatant pandering gets tiresome. Akshay Kumar brings just the right amount of levity and Bhumi Pednekar shines. It’s the sloppy writing that is the culprit here. Toilet Ek Prem Katha had potential but it’s only sporadically entertaining. I’m going with a generous two-and-a-half out of five. Toilet: Ek Prem Katha is perhaps the world’s first love story to hinge entirely around a toilet. In a country where more people have access to mobile phones than loos, the subject is important and relevant. Inspired by true incidents, it’s also compelling material for cinema – a girl walks out of her loving husband’s home because it doesn’t have a bathroom.Sadly, the film that has emerged doesn’t do justice to the cause or the good intentions. I must repeat that it’s refreshing to see Hindi cinema tackle such challenging subjects. But a film has to work as a film. This one does, in fits and starts. I’m going with two and a half stars. The first half is entertaining because of the humour. The second half has a lot of drama but it does get too long and boring at places, mainly because the arguments put forth by Keshav in support of building a toilet are similar almost everytime he puts his case forward, whether before his father or the panchayat or the bureaucrat or the ladies of the town, etc. The humour quotient reduces post-interval but, thankfully, it doesn’t disappear. On the whole, Toilet – Ek Prem Katha is a fair entertainer which will do reasonably good business and keep its investors happy. It deserves tax-exemption. What’s Good: Performances, honest attempt at tackling a social issue, funny moments in the first half & few dramatic moments in the second half. What’s Bad: Slow pace, goes haywire in the second half, steps over the line to be preachy, too many unnecessary songs.Loo Break: In many songs! Watch or Not? : Yes! Because despite of flaws the issue raised in the film is something everyone should be aware of. 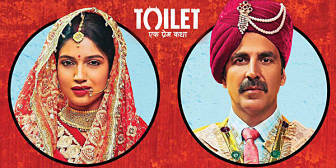 The intent of Toilet: Ek Prem Katha may be commendable. The execution is hugely hamfisted. When a Bollywood filmmaker assumes the role of a cheerleader for a government campaign on whose efficacy the jury is still out, you know you’ve been had.Toilet: Ek Prem Katha is as avoidable as what it rightly rails against – open defecation. This film is a satirical take on the age-old ‘tradition’ of seeking fields to relieve ourselves. Mercifully it steers clear of being a documentary on sanitization. Instead TEPK is a robust love-story striking a balance between entertaining and educating. The second-half borrows the template for films that address causes and allows for some lecturebaazi. A10-minute snip here would’ve helped the focus stay sharper. So whether you have pressing matters to attend to or not, please take a detour to this toilet. Each of us needs to raise a stink about what our countrymen do in the open. . The first half of the film is crisp and tightly packed but the same can’t be said about the other half. After interval, the film tends to get a bit preachy but that is expected if you have a much-debatable topic like open defecation to be addressed. It might feel a bit predictable but it is not something you can’t sit through. Overall, it is a good entertainer which leaves you with a food for thought after you exit the movie hall. Yes, you might hear the word ‘ toilet’ multiple times throughout the film but you will soon get comfortable with it. Go for the film, if you are looking for a well-scripted film backed by power-packed performances by the actors. It’s a great idea to build a love story to address a social issue but one can’t help but notice the political agenda behind a film like this. Too many references to Swachh Bharat, the Prime Minister of the country and even demonetisation make you question the real intention of the film. Toilet: Ek Prem Katha might have sounded great on paper, but loses impact in its telling. The film gets way too loopy and indulgent that I actually heard someone say ‘What crap man!’ aptly summing up a film called Toilet. The film is a satirical comedy film in support of Indian Prime Minister Narendra Modi’s Swachh Bharat Abhiyan, a governmental campaign to improve the sanitation conditions in India, with emphasis on the eradication of open defecation in public areas, especially in the rural areas of India.